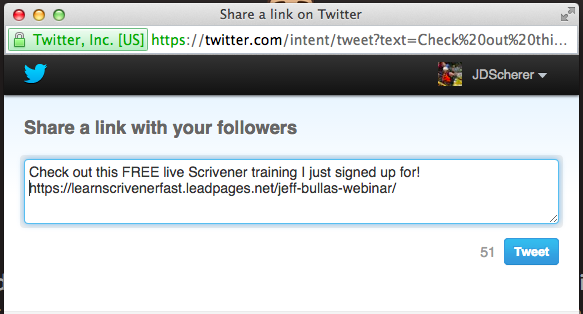 Promotion for your webinar has been a hit. Social, email, ads. You’ve covered every base and knocked it out of the park. Tons of people have registered. You’re stoked. Even your favorite influencer Tweeted about it. What if nobody actually shows up? The thought can paralyze even the most experienced marketers. It’s easy to get people to sign up, but having them actually attend is another matter. Sometimes it may feel like an impossible task. How can we pull our audience in so that they’ll sit and listen to us? Every webinar experiences registrant drop off. You can’t avoid it. But there is one way you can beat the 50 - 70% drop off that most see: Your “thank you” page. A thank you page, or post-signup page, is the page people are sent to after they register for your webinar. Most just have a simple “thank you” message. But we can do better. It’s like the text you send someone the day before a blind date. What last impression do you want to make? To find out what works best, we researched dozens of webinar thank you pages. We broke down the most important aspects into a simple 4-step formula. And we used that formula to create one of our most effective webinar thank you pages ever (see right). In this guide, ’ll show you how to use it. 4. Jog your registrant’s memory with calendar reminders. It’s much easier to bail on a reservation at a restaurant than it is to bail on a friend who is waiting for you at a restaurant. A video introduces you to each registrant. And makes them realize that a real person will be there on the date of the webinar, waiting to present to them. This decreases the chance you’ll be stood up. Think of the thank you video on your thank you page like a cover letter when you’re applying for a job. Without it, people may understand your qualifications and what you’ve done in the past, but they don’t know who you are. They don’t know why you (in particular) are right for the role or what makes you better than your competition. A recent report from Insivia found that “90% of users say that seeing a video about a product is helpful in the decision process.” When doing a webinar, YOU are the product. Like a handshake, introducing yourself in your video is your first personal interaction with your registrants. It’s crucial to them feeling like they know and respect you. Like a benefit list in your landing page, telling people what your webinar will cover in the Thank You page re-affirms their registration and prompts them to complete your Next Steps. See more on Next Steps in section 3 below. A lot can go wrong with your email strategy, so be sure your registrants are waiting for your emails. This decreases the chance that a reminder email will be lost in a spam or promotions folder. A Thank You Page is the best possible place for you to provide value you didn’t include in your registration page. Use words and phrases like “exclusive,” “secret,” “never-before-seen” and “first access”. People tend to remember facts presented as images far more than facts presented as words. This means that although you’ll have it posted and remind registrants with email it’s even more essential that you speak the words in a video. Sharing their registration publically increases the chance of someone following through (as they have an obligation to do so). See more on this in section 3. 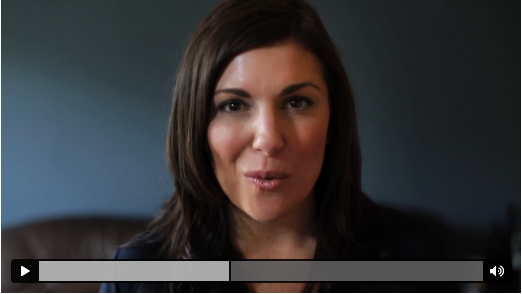 Tone of voice (and a smile) is everything in a short video. You want to get your registrants as excited as you are, and communicating your excitement is a huge part of that. Say that you can find the content of the webinar anywhere else. Don’t refer your registrants to another source of information (even if it’s you). Try to communicate that your webinar s a fountain of information they can’t find anywhere else, so there’s no point looking. Be straightforward: Tell registrants that they should attend! A casual, personal video can be better than a professional one. I spent a few days making my first video, perfecting it and editing for hours. I filmed my second video quickly and casually. Still scripted, but far less “perfect.” Attendance rates were the same for both (but the ROI for the second was far higher). Test it yourself! Make your Thank You Page video useful for more than one webinar. Use phrases like “this webinar” instead of the specific title. 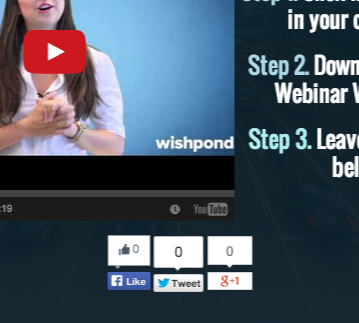 Create one video for each broad subject you might host a webinar on. And set your video to “Private” on Youtube so it can’t be found by consumers. Part of this relationship is built in the video: Showing your personality, enthusiasm and likeability. But it can’t end there. Including a testimonial is like having a wingman at the bar. They’re an objective source of information, and far more believable than your cliche pick-up lines. Check out an ideal testimonial, showing the six best practices you need to have. Reviews produce an average of 18% uplift in online sales. Including a customer testimonial is like having a wing man at the bar. They are (theoretically) an objective source of information, and far more believable than your own cliched pick-up lines. 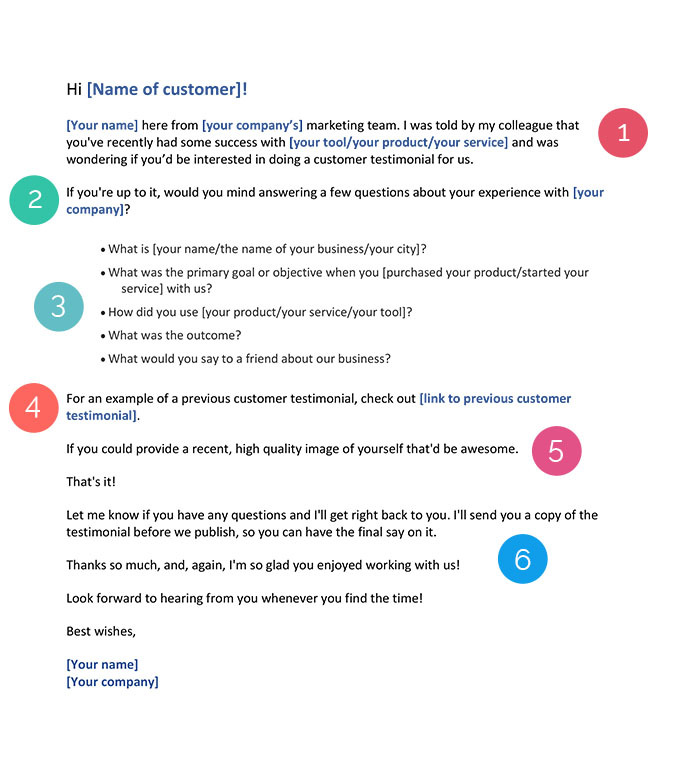 1) If your customer reads your introduction completely they’ll read the rest of the email. Be sure to mention who you are and provide a bit of context. Try to drop the name of someone they know. 2) Be sure to pose your testimonial request as a question: “would you mind” is good, as they have to respond with “Yes I would mind!” which is unlikely. 3) A simple bullet-point list of what you need or the questions you need answered communicates everything quickly. Avoid paragraphs if possible. 5) A photo is a necessity for your testimonial. Be sure you mention “recent, high-quality” as a 25k jpeg probably won’t suffice and you don’t want to chase them down with further emails. Once your registrants have signed up for your webinar, you need to deliver even more value to ensure they attend. To do this, use a statement of proof as your webinar thank you page’s headline. “exclusive [new statistics/case studies/sector report] before anyone else. If your webinar registrants share on social that they’re going to your webinar (rather than simply promote it) they have some skin in the game. It’s like hosting a potluck. True, the host (you) needs to provide the main course, but unless all of the invitees do their part, it won’t be a success. If an attendee told someone they’re bringing the salad, they no longer have a choice as to whether or not you’ll come. Push registrants to share with a “Share” step in the “What to do next” section. Authority (or trust) symbols like this have been proven to increase landing page conversion rates by 42% or more in A/B tests. Imagine how it works with a person’s reputation! See how to set up a Click-to-Tweet function in your Thank You Page. Leading up to the webinar, make a Tweet each day asking people to Tweet a question they would like answered in the webinar. In these Tweets, @mention people who have Tweeted about the webinar. They will be the ones most likely to answer. And mentioning them will make sure they see the Tweet in their Notifications. This provides the individual registrant with a personal reason to attend. Be sure you don’t answer any questions until the webinar itself! Just reply to each Tweet with “Thanks for the question! We’ll make sure to answer it in the webinar! Get an example worksheet you can use as a template for your own webinar. To make sure your registrants don’t forget, you could email them three times a day, every day, until you go live. Like a kid in the back seat of the car saying “are we there yet?” every 30 seconds. Or, you could be more subtle (but achieve the same result) with these three strategies. Most people live by their calendar. Make it easy for registrants to add a reminder with a one-click “Add to Calendar” call-to-action. A webinar worksheet is a simple, fill-in-the-blank document. It gives registrants a way to follow along and build a personalized strategy to take action after your webinar. It also gives them a teaser of the specifics that they’ll learn. It shows them specific items and give them new, or better, reasons to attend the webinar. 2. Another in the video that tells them to click the download link. A CTA box that corresponds to your “Next Steps” prompt beneath your social share icons. 3. A CTA button that corresponds to your “Next Steps” prompt beneath your social share icons. 4. Plugin a Facebook comment section into your Thank You page. 5. Prompt a comment with a CTA in the “Next Steps” section that reads “Leave a Facebook comment below saying you’ve registered”. And be sure to reply to each. A personal reply further develops the strength of your relationship with your registrants. Again, this will decrease the chance of them standing you up. Your reply will also be sent through as a Facebook notification, which serves as another subtle reminder (or even brings them back to your Thank You Page). Also encourage people to leave questions in the comment section that they want answered during your webinar’s Q&A. This increases the value of your webinar for each individual registrant. A registrant that’s asked you a question is one who will attend to hear the answer. 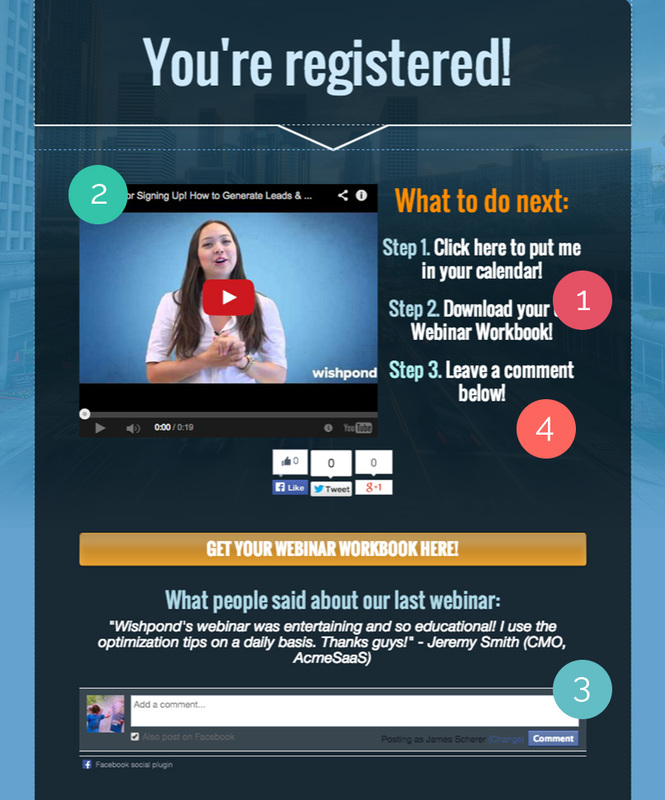 Get your webinar workbook today! 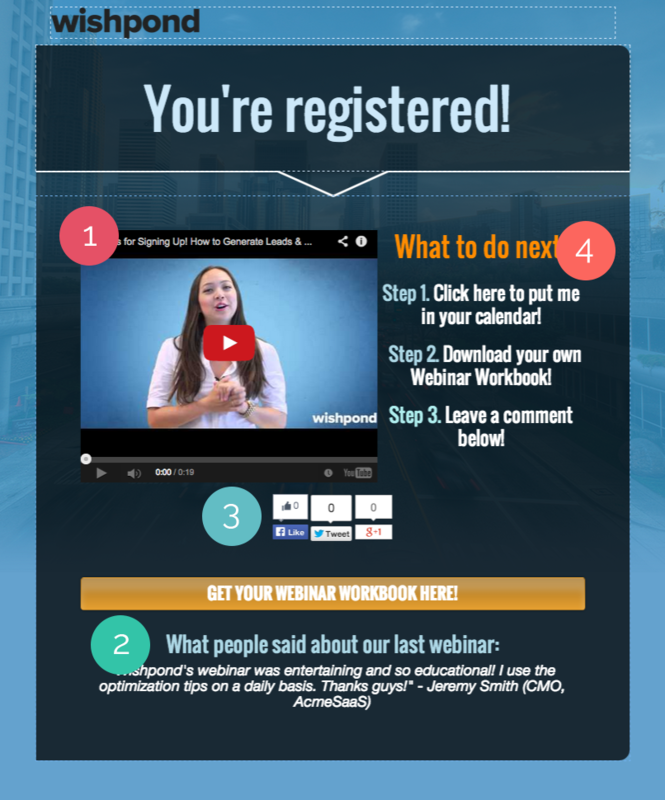 Download your webinar worksheet now! Get ahead of the game. Download your free webinar worksheet now. Now it’s time to take action. Use this full stack of tutorials to walk you through creating your webinar thank you page. The necessary formulas and templates are below. 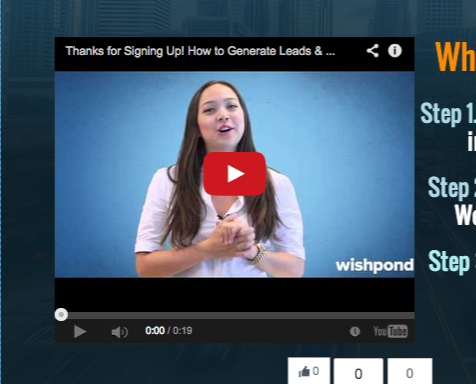 Get rolling - and do everything in this entire article - with Wishpondtoday! Thanks for reading the first post in our new content marketing strategy. I’d love to hear your thoughts in the comments below! James is a content creator at Wishpond and author of The Complete Guide to Landing Pages (among others). When he’s not writing or designing for Wishpond he’s enjoying Vancouver breweries, ultimate frisbee and risking his life biking around the city.